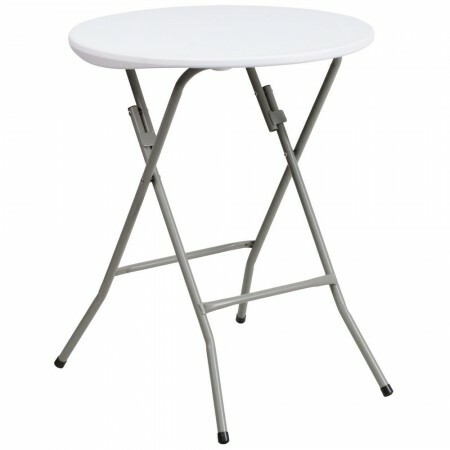 Flash Furniture DAD-YCZ-80R-1-SM-GW-GG Round Granite White Plastic Folding Table 24"
TigerChef > Furniture > Flash Furniture > Flash Furniture Restaurant Tables >< Flash Furniture Folding Tables > Flash Furniture DAD-YCZ-80R-1-SM-GW-GG Round Granite White Plastic Folding Table 24"
$43.99 Flash Furniture DAD-YCZ-180-GW-GG Granite White Plastic Folding Training Table, 18" x 72"
$154.99 Flash Furniture DAD-YCZ-180R-GW-GG Round Granite White Plastic Folding Table 72"
$44.99 Flash Furniture DAD-YCZ-80R-2-BAR-GW-GG Round Granite White Plastic Bar Height Folding Table, 32"
$40.99 Flash Furniture DAD-YCZ-80R-GW-GG Round Granite White Plastic Folding Table 32"
$96.99 Flash Furniture DAD-YCZ-154-GW-GG Round Granite White Plastic Folding Table 60"
$60.99 Flash Furniture YT-WTFT18X72-TBL-GG Rectangular Wood Folding Training / Seminar Table with Smooth Clear Coated Finished Top 18" x 72"
$67.99 Flash Furniture YT-WTFT18X96-TBL-GG Rectangular Wood Folding Training / Seminar Table with Smooth Clear Coated Finished Top 18" x 96"
$142.99 Flash Furniture DAD-183RZ-GG Round Bi-Fold Granite White Plastic Folding Table 72"
$60.99 Flash Furniture DAD-122RZ-GG Round Bi-Fold Granite White Plastic Folding Table 48"
$95.99 Flash Furniture DAD-154Z-GG Round Bi-Fold Granite White Plastic Folding Table 60"
The versatile Flash Furniture Round Granite White Plastic Folding Table 24" is perfect for both indoor and outdoor use. Designed with a granite white table top, this table matches any decor while its stain-resistant 1-3/4" thick plastic construction makes it easy to clean and maintain. Thanks to its gray powder coated cross legs, this folding table is exceptionally stable and will withstand weight of up to 180 lbs.. For added convenience, the table legs can be folded underneath for portability and easy storage. 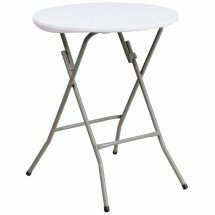 Dimensions: 24" x 29-3/8" x 24"
Sturdy, easy to use and tuck away when not needed. grey legs look a bit institutional, but it's a perfect size for what I needed. I used for a party. The legs stick out a bit and people kept bumping it. Could you please tell me the overall height of this table?